As with all Color Riche lipsticks, the L’Oréal Laboratories have selected only the purest and finest colour pigments, and the unique combination of Omega 3 and Vitamin E moisturises lips for smooth application and comfortable wear. 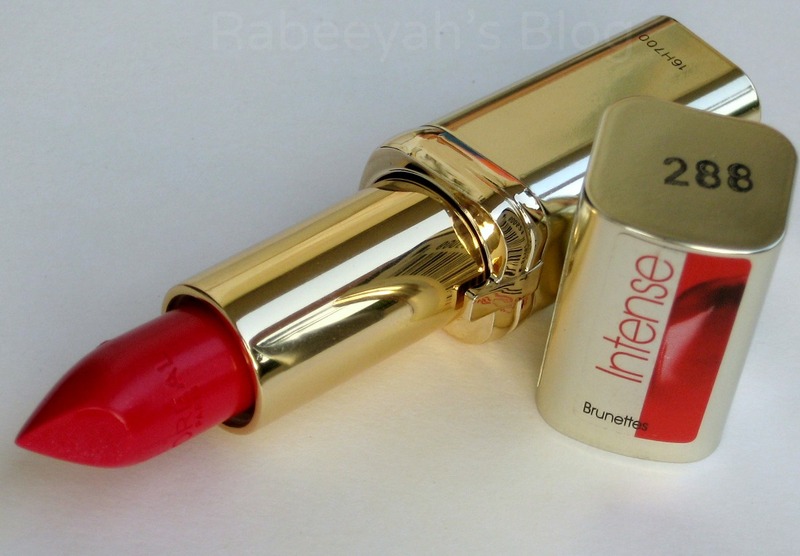 L’Oréal Paris has designed new intense lip shades to bring out the best in every woman! L’Oreal Color Riche lipsticks have always been my absolute favorite. Why? Because, L'Oreal Color Riche lipsticks stay true to color, are creamy, moisturizing, long-lasting and has sturdy packaging. First impression of L'Oreal Color Riche lipstick is the smell, it has a mild sweet floral scent; not over-powering. It has not taste, which is a good thing. 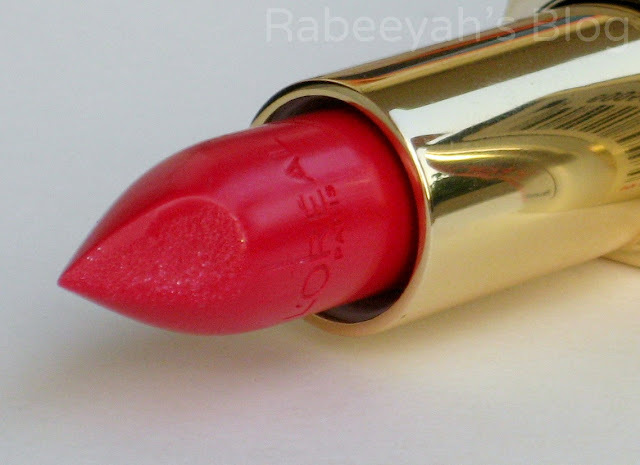 The texture of the lipstick is very smooth, soft and creamy. 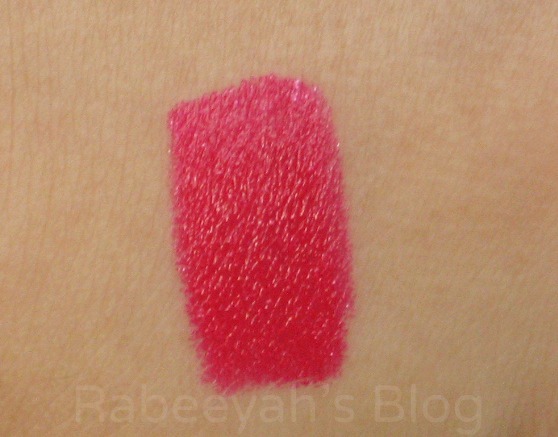 It is a full coverage lipstick, and is highly pigmented. One swipe of the product is pretty intense. It is long-lasting and moisturizing. The lipstick has a color indication sticker at the bottom, with the shade name and number, also the shade number is printed on top of the cap of the casing. Before opening the lipstick, I saw the color sticker at the bottom, and saw the sparkling sticker, which made me scared because I am not a glittery lipstick person. As for the packaging, it is not something very catchy or attractive. It is golden sturdy plastic; not flimsy. You don't have to fear about it to get open in your bag. 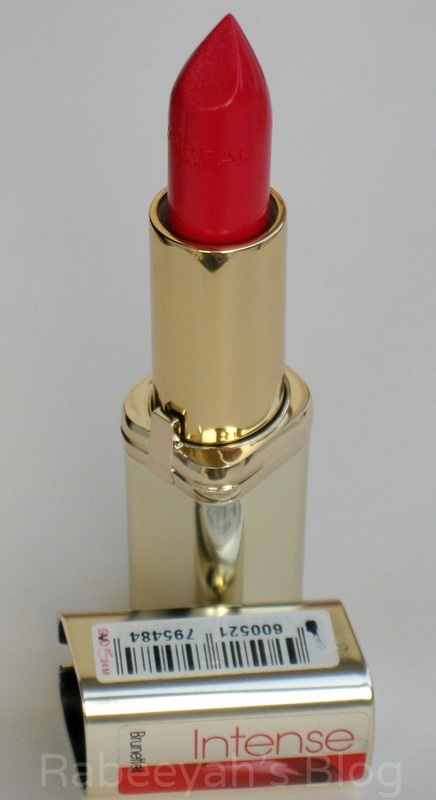 The lipstick has the name L'Oreal embossed on it, which I love. '288 – Intense Fuchsia', the name describes the shade, doesn’t it? It is a bold and bright fuchsia color, with hints of blue undertones and tiny amount of gold specks in it. The tiny specks makes the lipstick shine when applied, it's not crazy shimmery. I'm personally not a fan of frosted or shimmery lipsticks; little amount of shimmer doesn’t bother me. The color is intense, as you can see – looks gorgeous after applying. It is a staple color, which will look good both on warm and cool skin tones. 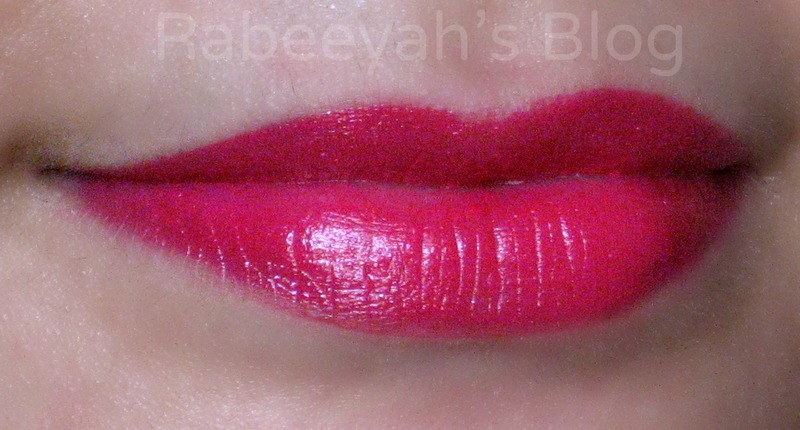 It is a semi-matte, with slightly glossy finish - a cremesheen lipstick. Also, it doesn't melt into the lines of the lips or feathers out. It glides on very easily, and stays fresh on my lips for 6 to 8 hours, and then starts to tone down; doesn't lose the color intensity. Just the glossy-ness fades and then you can see the gold specks shining on the lips. In between this time, I had my food and tea, but it stayed on my lips. As it is a dark shade, it lasts longer and stains your lips or should I say, the color deposits on your lips and stays on for quite a long time. I love the staining part in the lipsticks, that way you don't have to re-apply the lipstick. It sticks to the lips, but is not sticky at all. Does not melt into the lines of my lips. Yes, I will recommend if you are looking for something that is long- lasting and moisturizes your lips. Especially, if you are a working lady. Available at? All the leading supermarkets, at L’Oreal Paris kiosk. The good news is, I was sent 2 lipsticks, and I am giving away one L’Oreal Color Riche Lipstick, same shade to one of you. Exciting? But it is only open to residents of Pakistan. Check my Facebook page HERE for more details. 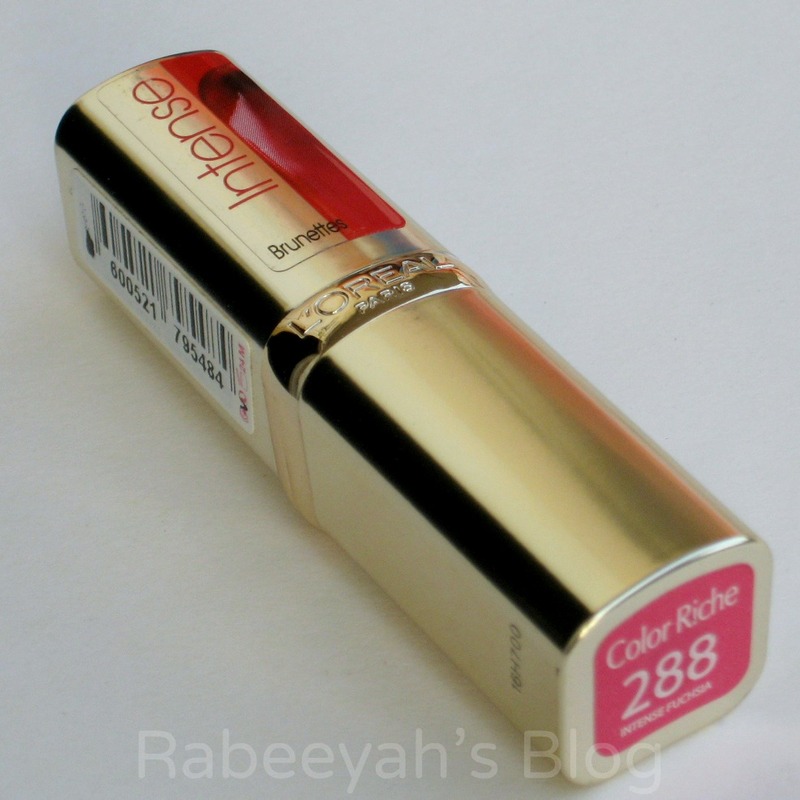 Do you own a L'Oreal Paris Color Riche Lipstick? Which shade? Wow..so aptly named! Beautiful colour but I guess too bright for me! It looks soooo good. I'm buying Red Passion. You are saying this is a dark color?